I spent the morning working on Waggoner Guide stuff…updating information on Alert Bay. 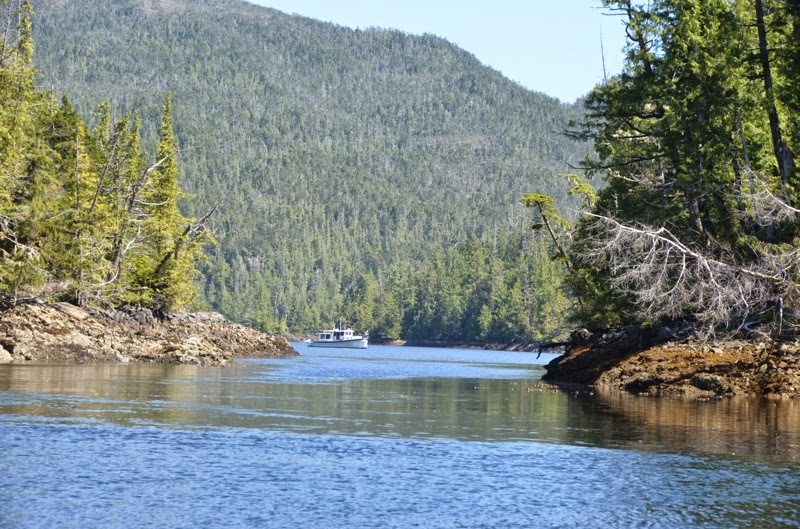 I took the dinghy to Sointula to get information there, then headed back to the boat for lunch. 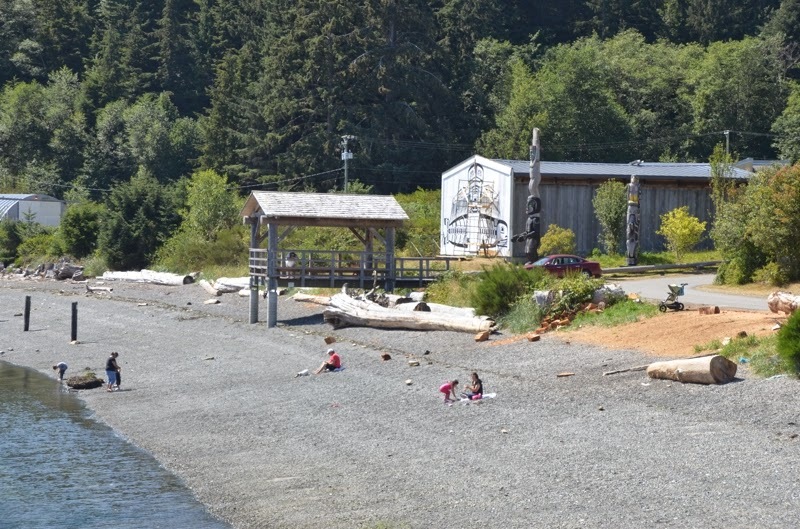 After lunch I went ashore in Alert Bay to visit U’mista Cultural Centre, a museum housing First Nations artifacts. People enjoying the beach in front of U'mista Cultural Centre. As I walked along the waterfront to the museum I saw three rafted fishing boats drifting rapidly towards my boat. At this point I was a half-mile walk from the dinghy, and then another few minutes to the boat, so there wasn’t much I could do. Surely, the fishermen had seen my boat, right? Nope, they hadn’t. They kept drifting for it. Dan, on Puffin, started honking his horn and yelling. I watched helplessly, camera out to record the events in case the insurance companies needed them. The fishing boats drifted right into Safe Harbour’s starboard bow, seemingly aware of my presence only after impact. I hustled back to the boat and inspected for damage. The only evidence of the collision I could find was a torn piece of electrical tape on the bow rail (used to mark straight ahead). I talked with Dan and Mary on Puffin, and they said they had more pictures if I needed them. To the skippers of F/V Cork to Cork, F/V Pacific Baron, and F/V Pacific Endeavor: Pay attention! With a good forecast and observed conditions, I departed Goose Bay before sunrise to round Cape Caution. The only problem was fog, but that meant little wind. As I exited Rivers Inlet my radar screen filled with targets, Five boats were travelling in close formation, just a quarter mile apart, and a couple others were behind them by about three quarters of a mile. They were traveling a little closer to shore than I like to, so I slowed and passed behind them before turning onto a parallel course. Later I saw they were a group of gill netters. Ocean conditions were as benign as the weather forecast had indicated—a two or three foot groundswell, no chop. 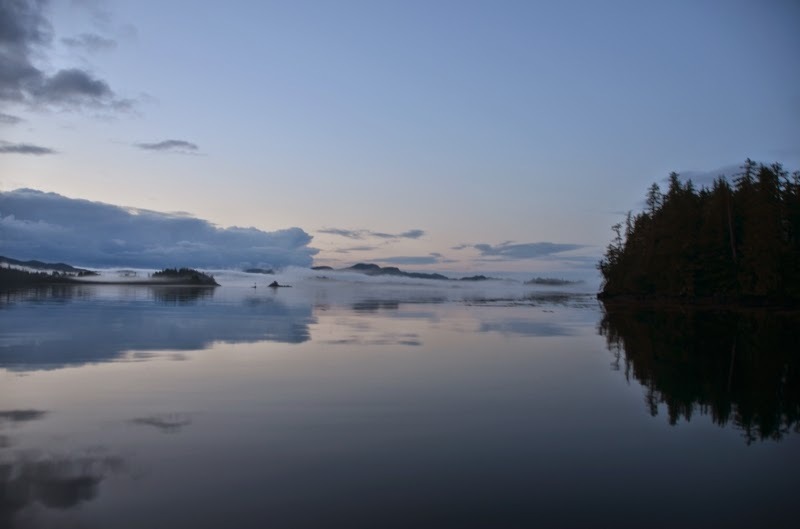 The fog lifted as the swell died out in Queen Charlotte Strait and I headed for Alert Bay. 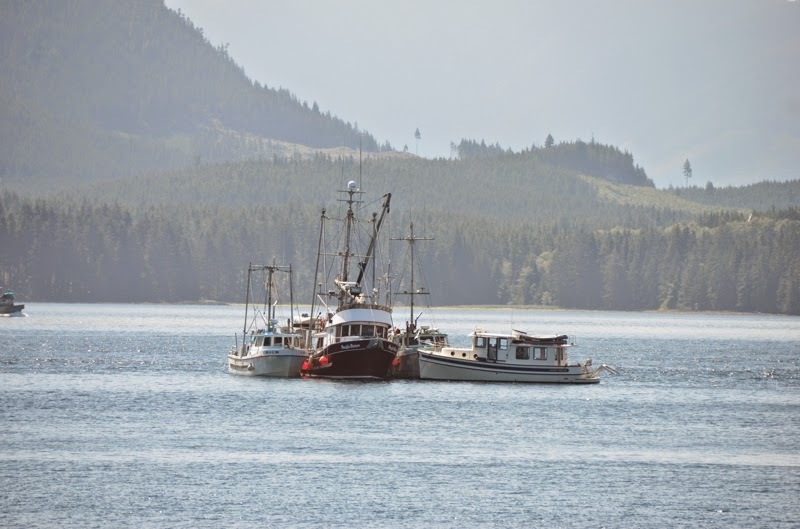 The docks were all full so I anchored out next to Puffin, one of the boats on the first Waggoner Alaska flotilla. First stop today is Dawsons Landing in Rivers Inlet. Rob and Nola are the owners, and take good care of the place. 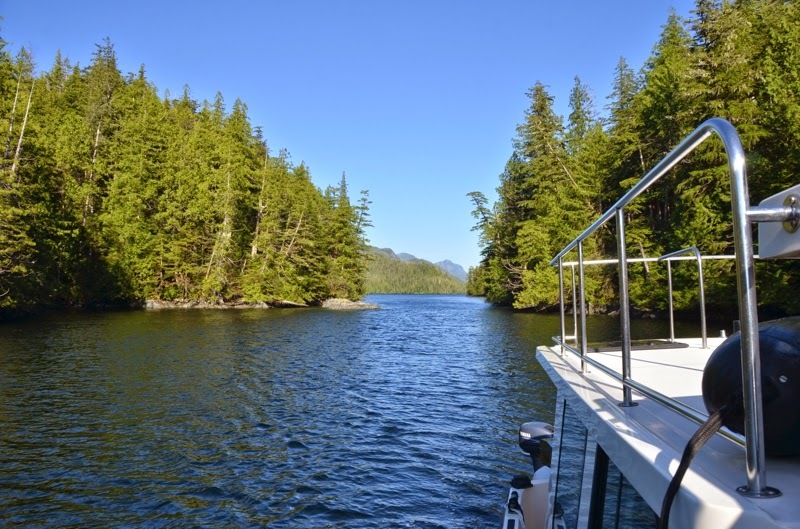 They have lots of moorage, a fuel dock, and a very well stocked store. 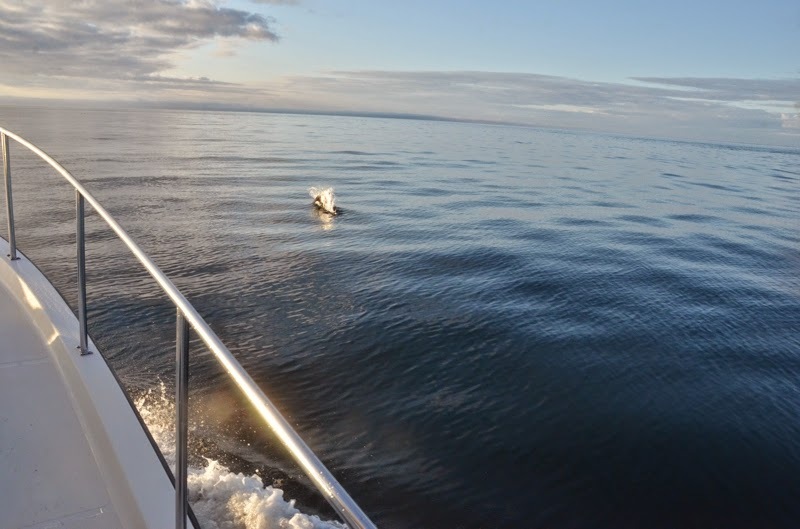 Dozens of dolphins in Fitz Hugh Sound. Then I headed for Goose Bay, home to Duncanby Landing and Goose Bay Cannery. 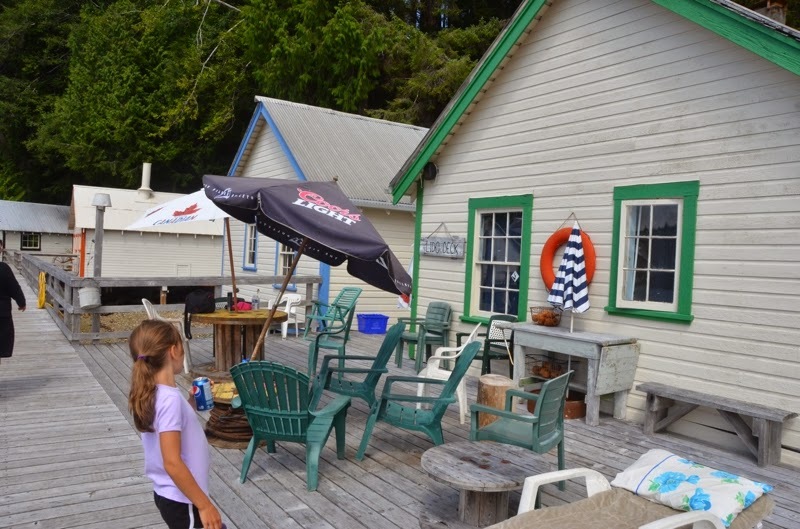 Duncanby is a high end place…shore power (30 amp) is $45 per night, moorage is $1.75 per foot, and laundry is $20. Goose Bay Cannery is a fascinating place. Like Butedale, Namu, and others along the coast, it was once a working cannery. 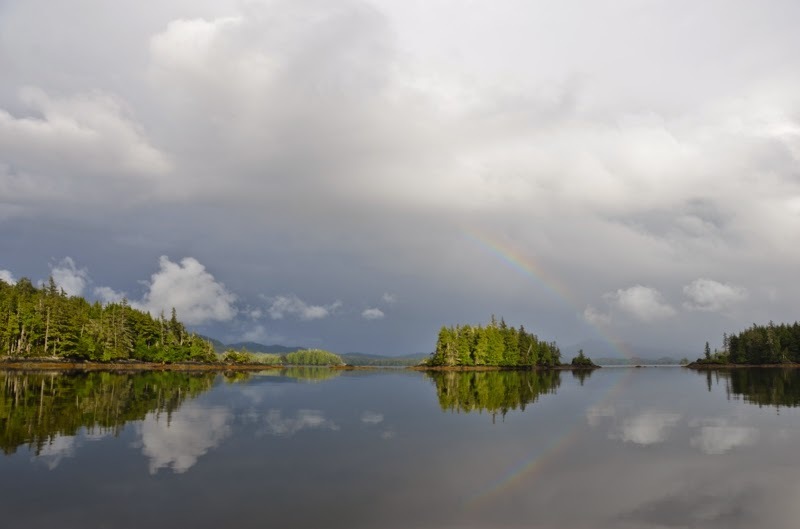 As refrigeration became better and the salmon fleet declined, Goose Bay was shuttered. About 10 years ago a group of 29 (mostly firefighters) purchased Goose Bay Cannery to turn it into a vacation spot for their families and friends. 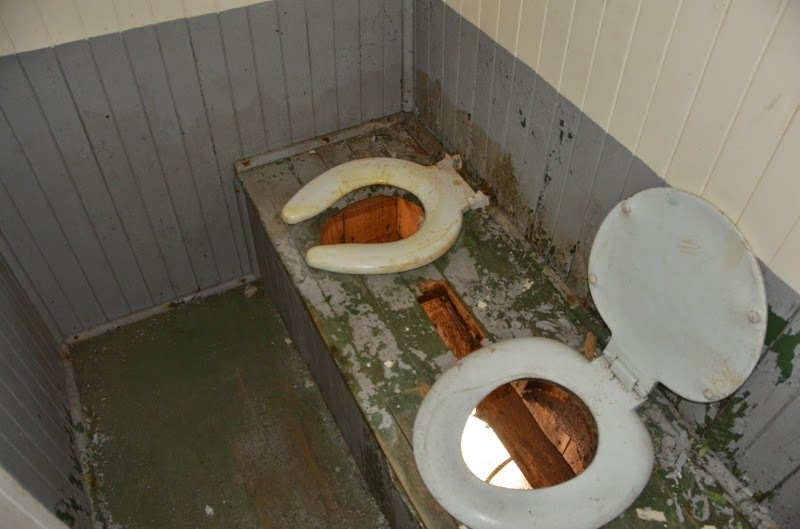 The original men's room at Goose Bay. Toilets flush at high tide only. Each owner puts in 9 or 10 days of labor a year. By doing this, they’ve significantly improved the place. They’ve got systems for power, water, and waste. 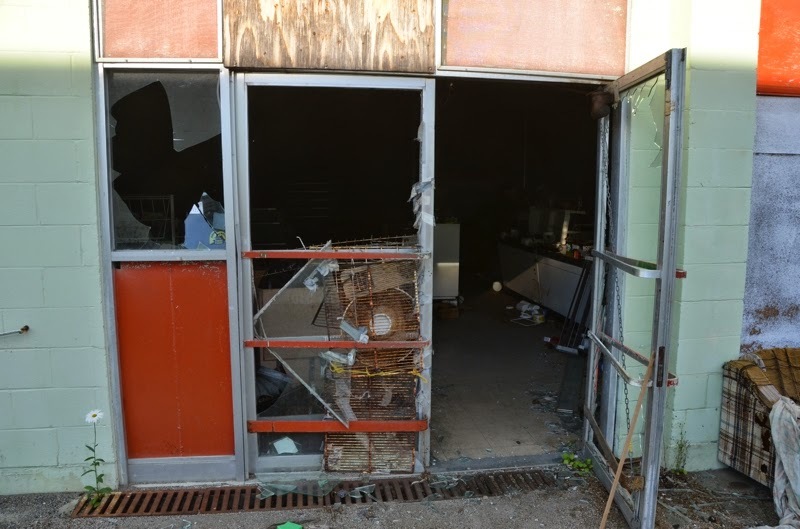 The buildings are shored up, structurally sound, and freshly painted. Cabins are in various states of renovation. They’ve even converted part of the old cannery building into an indoor hockey rink. Visitors are welcome at the dock, but are asked to stay out of the buildings unless they receive permission to enter. Fog! I woke up to dense fog. I couldn’t see more than 50 feet in any direction. The entrance to Penn Harbour is fairly narrow—perhaps 75 feet wide—and would be tough to navigate for the first time in fog. Thankfully, I’d been through yesterday, and had a track laid down. Combined with radar, exiting was easy. Given the foggy conditions I passed by Evinrude Inlet and Kent Inlet. And given the calm conditions, I opted to go around the south end of Price Island, in the ocean, rather than the longer, more protected route through Meyers Passage. Disney Wonder, one of the cruise ships doing the Vancouver to SE Alaska trip, called VTS with a medical emergency. I listened in as they described the problem: a passenger had a blood clot in their leg. The doctor on board wasn’t equipped to operate, so the passenger needed to be evacuated ASAP. The doctor said the passenger needed surgery within 6 ½ hours to survive. Given the fog, helicopters couldn’t fly, so Disney Wonder set course for Seaforth Channel at 22 knots. Meanwhile, a CCG motor lifeboat raced towards Seaforth Channel. 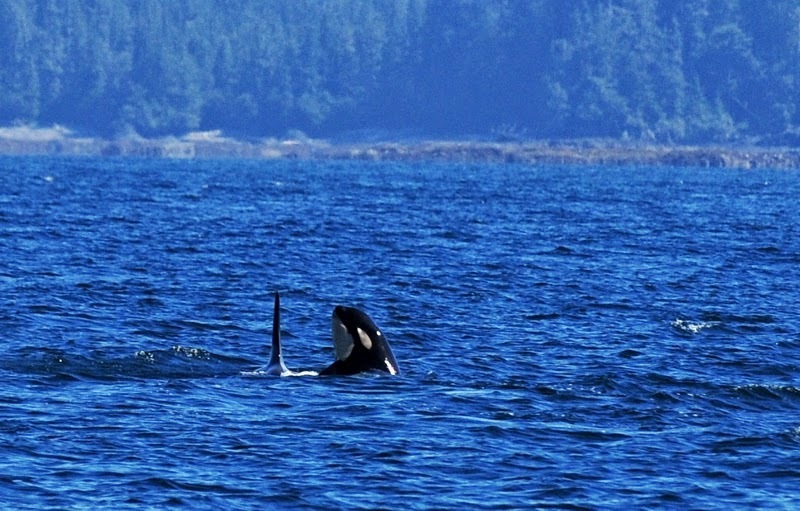 They met just off the southern end of Price Island and exchanged the ill passenger. Apparently a fixed wing medevac plane was standing by in Bella Bella to take the passenger to a hospital that could operate. The fog finally broke up as I crossed Milbanke Sound. 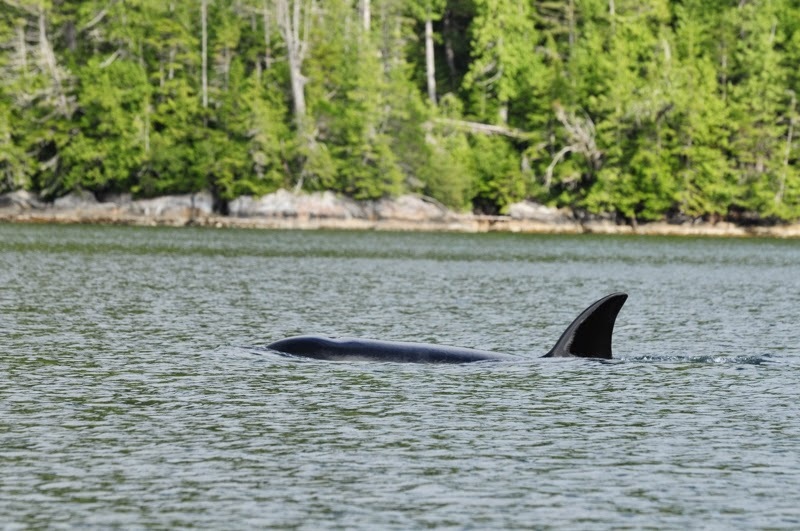 As I entered Seaforth Channel, I spotted a dozen or so orcas. Lots of boats, too…it was obvious I was back on the main Inside Passage route. 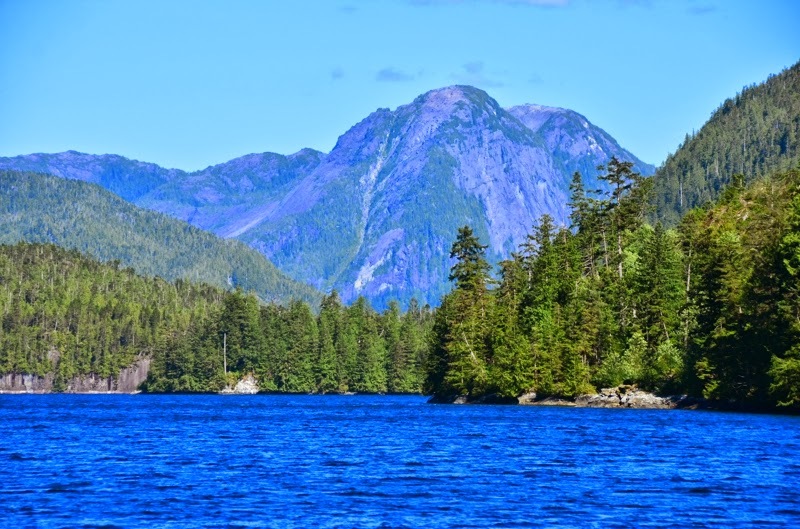 I passed Shearwater and Bella Bella, bound for Rock Inlet, near Namu. 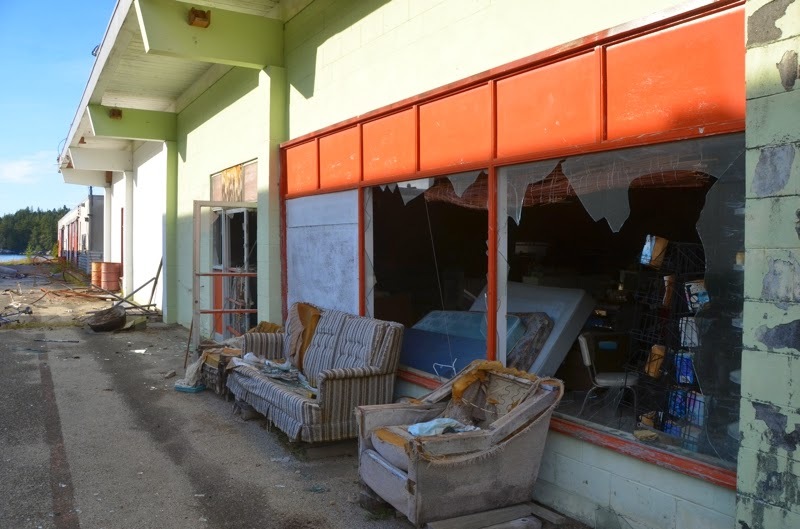 The caretakers at Namu left at the end of last summer, and I wanted to see what had become of the place. Rock Inlet, by the way, is a beautiful anchorage, but not terribly secure. The bottom is, you guessed it, rocky. The anchor skipped across rocks before catching on something, and I could hear the chain dragging across rocks. Probably not a good choice in a serious blow. 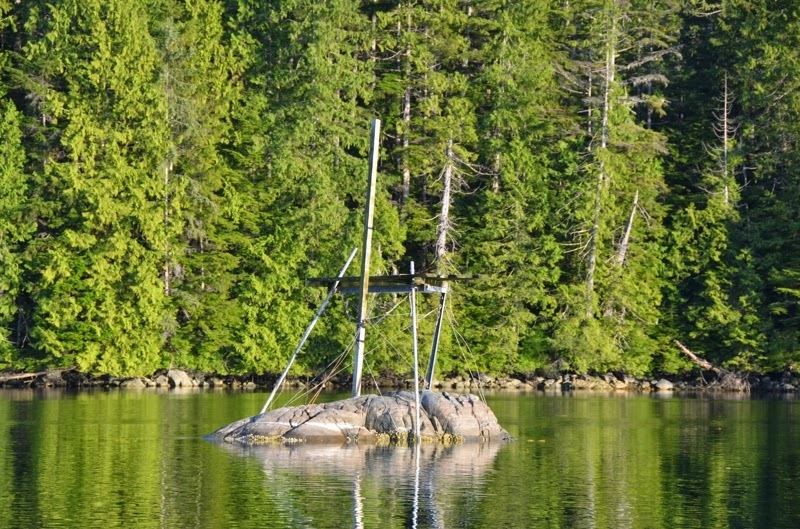 Platform built on a rock in Rock Inlet. Broken windows at the Namu store. 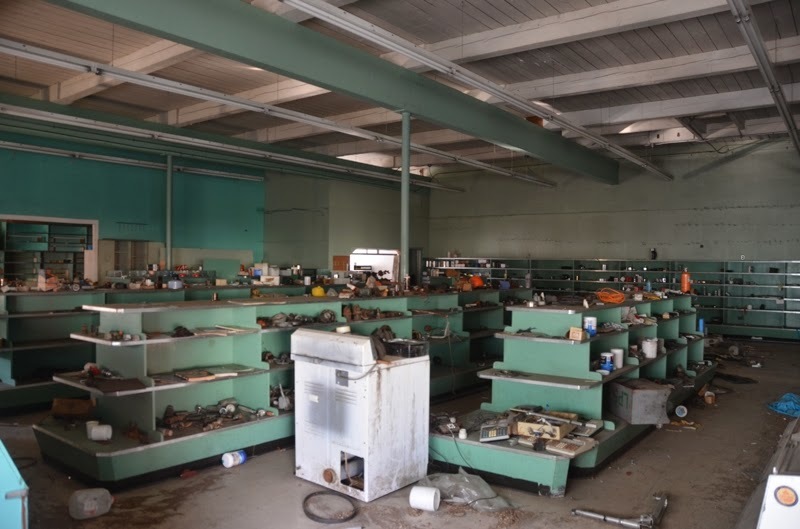 And most of the inventory is gone. I got an early start this morning. With a track already laid down on the GPS, it was easy to get out of Ire Inlet. I headed first to Patterson Inlet to gather information for the Waggoner Guide. 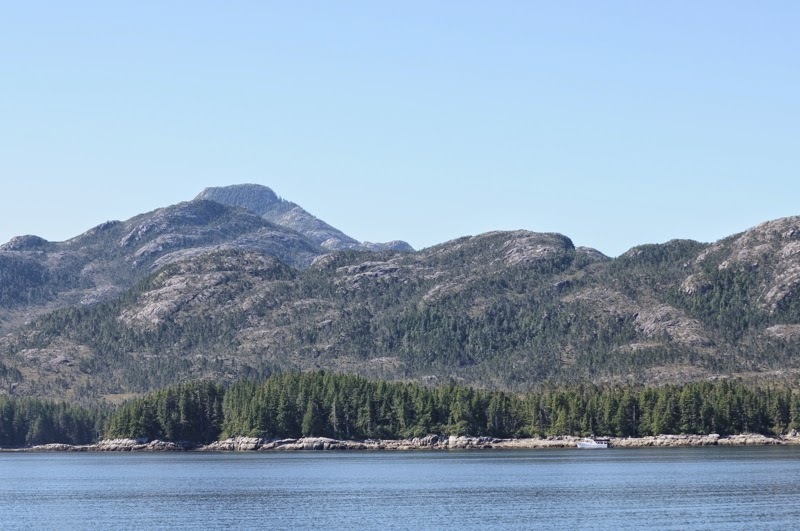 It’s a gorgeous anchorage, easy to enter, and with space for as many boats as are likely to be there. Then off to Surf Inlet. I took to inside of Campania Island, thinking it would be better protected from the ocean swells. 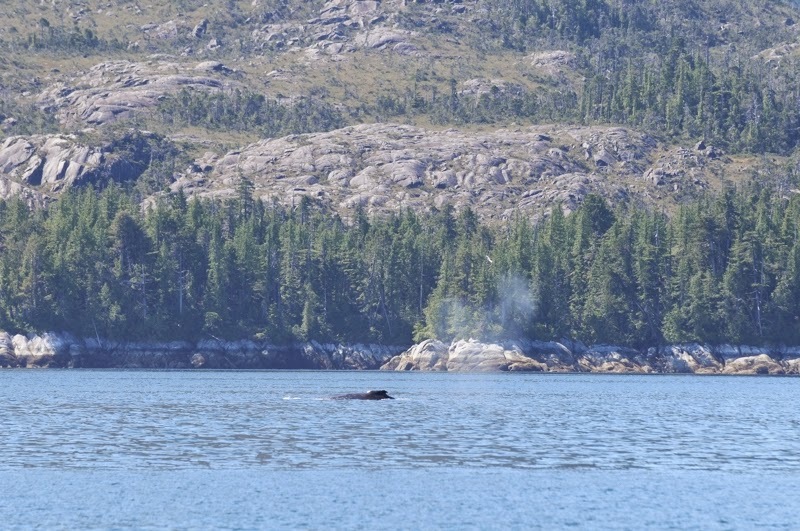 It was flat calm, and I saw several humpback whales. Traffic increased on the inside of Campania Island…lots of people out fishing. A humpback with Campania Island in the background. Before entering Surf Inlet I anchored and explored Emily Carr Inlet. 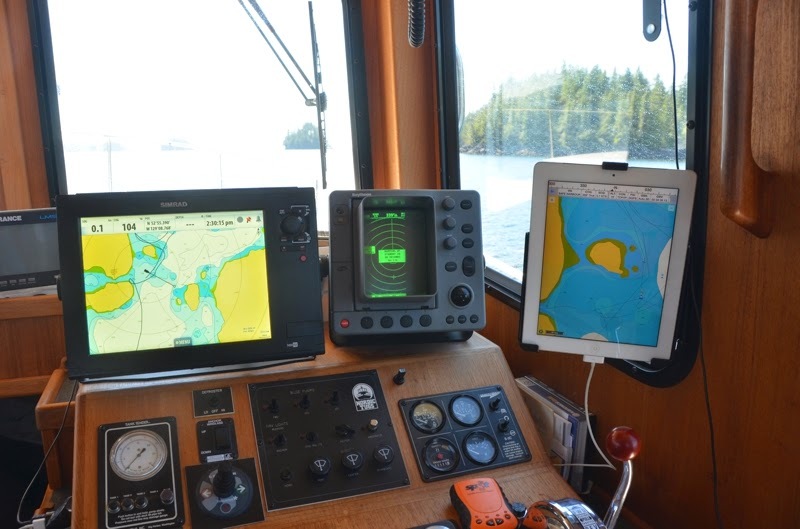 For some reason, my Simrad chartplotter was wayyy off in Emily Carr Inlet. It plotted my position about 250 feet from where I actually was. The iPad with Navionics and iNavX was spot on, as was Coastal Explorer and C-Map and CHS charts. 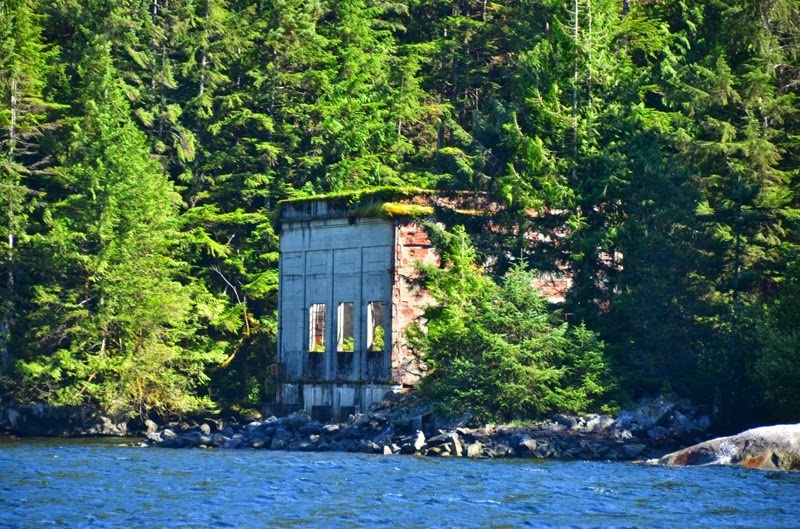 Exploring Emily Carr Inlet by dinghy. After an all to quick visit to Emily Carr Inlet I headed into Surf Inlet. As I progressed the scenery got more impressive…high mountains and green hillsides all around. Almost to the head of Surf Inlet. I’d wanted to anchor in Penn Harbour and take the dinghy to the head of the inlet. This would allow me to go ashore and hike to a nearby lake. Unfortunately afternoon inflow winds of perhaps 20 knots made this impossible. I took the Nordic to the head of the inlet, but couldn’t find a suitable place to drop the anchor, so I headed back to Penn Harbour and anchored for the night. Another delightful, spacious anchorage. I kept a close eye out for Spirit Bears, but never saw one. Another foggy morning. After some last minute email I departed Prince Rupert in thick fog. Chatham Sound was perfectly calm, but crowded. I spent a lot of time staring at the radar screen trying to interpret what other boats were doing. Instead of taking the Grenville Channel route (which is kind of boring), I turned to starboard and headed down Ogden Channel. I stopped briefly in Kitkatla to get information for the 2015 Waggoner Guide, then worked my way through Petrel Channel. I only saw one other boat the whole way through Petrel Channel. Looking back at the narrow entrance to Ire Inlet. Ire Inlet was my destination for today. The books noted the narrow entrance, but I didn’t full appreciate just how narrow until I saw it. I’d estimate the entrance is only 25-30 feet wide. Once you enter, you’re committed. The water was deep, however, and entrance was straightforward. One sailboat was already at anchor, but there was plenty of room for me. Nice anchorage. Erik flew out this morning (actually got driven to Hollis, on the other side of PoW Island, since it was too foggy to fly into Craig). I left soon after. My departure was complicated by the arrival of a whole bunch of seine boats. They were rafted four deep behind me and three deep in front of me. I had about 2-3 feet of room off the bow and stern. But because the wind was blowing the seine boats behind me were blown forward, so the ~47 feet of space I had at the dock shrunk to just 35 feet further out. In order to get out I'd have to rotate the boat 90 degrees. I was happy to have the bow thruster. I kicked the stern out, used the thruster to rotate the bow 90 degrees, and motored out. I left Craig not knowing exactly where I was going. I wanted to get as far as I could to minimize the distance across Dixon Entrance tomorrow, but the guidebooks were pretty sparse in their description of the southern half of Prince of Wales Island. Based on the charts, it looked like the Barrier Islands have a few decent anchorages and I decided to give them a try. The weather actually began clearing as I headed south. The sun poked out a bit and the rain mostly stopped. I passed a few seiners and fish tenders, but not much else. This is a particularly remote-feeling part of Alaska. The Barrier Islands worked out okay as an anchorage. The bottom was rocky and irregular. On my first attempt to anchor, the anchor just dragged across the rock. I tried again in a slightly different spot and got a decent set. I wouldn’t trust it in much wind, though. View from the Barrier Islands. Note the rainbow. The Barrier Islands are beautiful. They remind me of the west side of Vancouver Island: rugged, raw, wind-and-wave lashed. 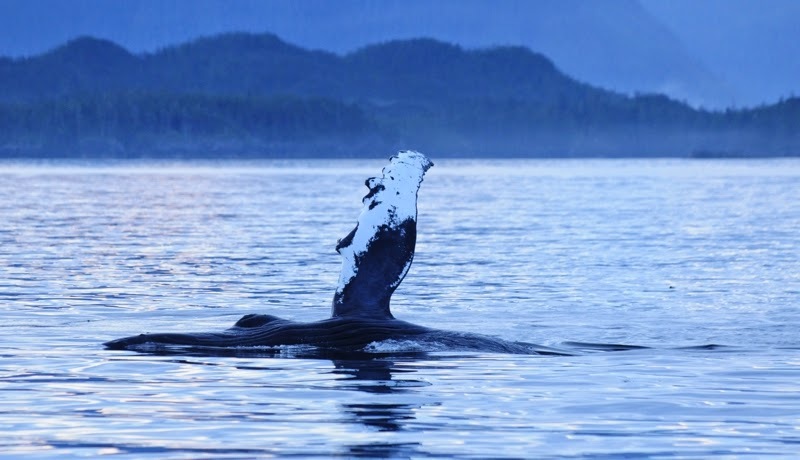 Tomorrow I’ll head to Prince Rupert.